With the MR. ROOTBEER® Kit, you'll make 2 gallons of great tasting root beer in as few as 3 days! The kit produces a very traditional old-fashioned tasting root beer that is a hit with adults and children alike. NEVER BREW MR. ROOTBEER WITH BOTTLES OTHER THAN OUR OWN PRESSURE RELEASE CAPS AND GASKETS. STANDARD PET BOTTLES AND GLASS BOTTLES CAN EXPLODE FROM THE PRESSURE. This basic recipe includes 2 packets of root beer mix and dry yeast, two packets of flavor crystals and two packets of No-Rinse Cleanser. Mr. RootBeer mixes are designed specifically to be carbonated in the bottle. Due to this carbonation process your root beer contains trace amounts of alcohol (about 1% ABW). Each Mr. RootBeer kit includes four reusable, amber, 1 Liter PET (Polyethylene Terephthalate) beer bottles. PET plastic is FDA approved for food and beverage. Each kit also contains four reusable plastic screw caps with pressure relief gasket. These caps are designed to release excessive bottle pressure as a safety measure.  Four self-adhesive stickers provided to apply a Mr. RootBeer label to your bottles. Use this plastic funnel to help transfer your root beer into bottles. This fun, informative guide contains complete four-step instructions, science projects, and lots of root beer facts. This product is kosher and does not contain any gluten, caffeine, nuts or dairy.